That bushing ends up being a pivot point...so you should not solid mount it. I asked a similar question recently. I can't see what is going on at the top of that strut when installed...how does the spring hold up the car? Is the entire weight of the vehicle on the center of the strut mount plate? Or is it like Fierohoho's--the spring contacting the body? 2. The ring that holds and allows you to adjust the spring height is call a what? Is the a size needed for it? 3. The sleeve with the outer threads on its call a what? Is there a set or needed size on it? Do items 2 and 3 get sold in a set? 4. That is a stock type strut correct, just with the retainer for the spring cut and ground off? Is this all that needed to make your own coil over? How much is everything else and where is a good place to shop for them? Either 12" or 10" will work. 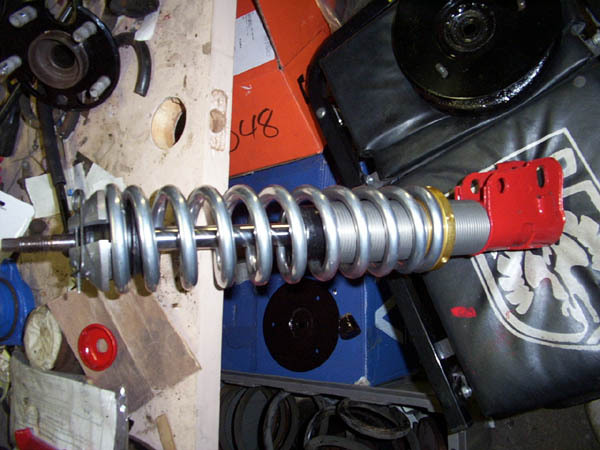 12" springs give you more travel before they coil bind (yes, 10" springs can coil bind before they hit the bump stops). If they don't have what you want, they can special order it. This is where I've gotten my springs from. Almost always sold as a set with #2. You can save a few dollars by calling Coleman up and geting them to send you just the sleeve and perch because the conical hat is not necessary. Yes, stock replacement strut with the spring perch cut off. You can get a short threaded sleeve and seat it on the spring perch, but then you can't use a 12" spring. Yes. The conical hat in other pictures is NOT REQUIRED. As you can see from the Summit and Coleman websites, the springs are $35 and the sleeve/spring perch assemblies are about $30. $65.side plus struts. The only thing wrong with this picture is that I didn't have a stock bump stop on it. Take the stop bump stop, cut the strut boot off of it and put it inside the spring. It fits perfectly and works just fine. The spring being in direct contact with the top plate causes absolutely no problems. Are you using the Stock Spring Perch trimmed up to hold the Sleeve???? Yes, that's the way this one is made. 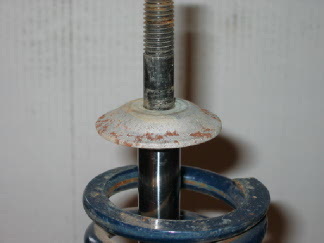 It is one of a pair of RCC coil overs I bought used. 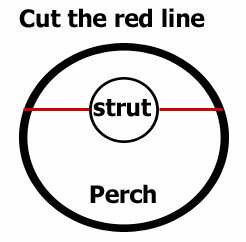 I recommend cutting off the spring perch entirely and putting on a full length sleeve for greater adjustment range. So the height of the car doesn't change with a 10" or a 12" spring just the possility of a bind. I was hoping to lower the car about 1 1/2 to 2 inches. I take it that is done by where you set the adjustable spring seat at? Yes, that's the way the adjustable spring perch works. 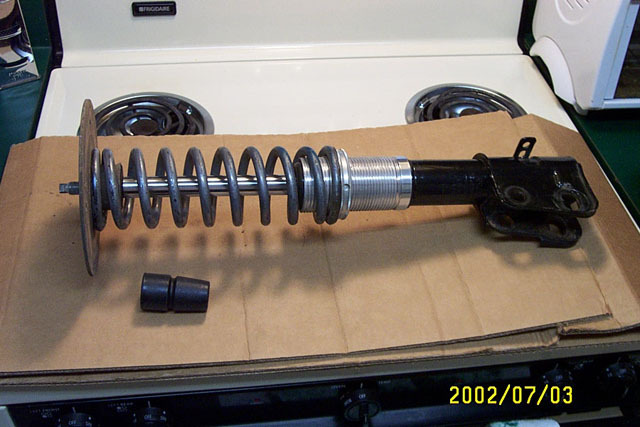 A 12" spring can limit the amount you lower the car IF you don' t have enough adjustment range on your adjustable spring perch. That's why I recommend the full length sleeve: to have enough adjustment range so that a 12" spring can be used. Depends on your struts. I wouldn't use anything but Konis with a spring over 300 ppi. KYB and QA1 make good suspenion parts without the $ tag. Having a 12" spring limits the drop more-so then the 10". I would recommend the 10" if you want the car really low with a 8" sleave. The coleman hat rides against a rubber busing inside one of the 2 shock mounting plates. 12" spring only limits the drop if you use the conical hat. If you don't do that, there aren't any issues with a 12" spring. What actually picots?. Wouldn't the ball joint take care of all movement? Because of the arc of the control arm, the top pivots slightly. I was hoping for an amount of movement when I posed the question, but I think I'll have to figure that out for myself. where is the best deal on 7" adjustable sleeves? mcaanda pointed me towards coleman racing products. $58.80 plus shipping for two 7" adjustable sleeve kits. The way I did things, when the car's jacked up the springs don't come down far enough to come off the center bushings in the top plates. I was looking at the pieces that came off the stock strut and I remembered someone mentioning that the rubber bushing in the top plate may not be designed to handle the up and down stresses from the strut rod. I figured that must be why there is a washer on both sides of the top plate. If I put the washers in the same place with my coilover spring installed it looks like it would work ok but will the top of the spring slide to one side or the other? I decided to cut a 1" strip of 16gauge metal and weld it on to retain the top of the spring. This will also make the lower washer stronger. I am using all the stock parts with this one addition and minus the dust boot. This should put the shock bumper at the stock height also. In case the top of the spring is a little lower than it could be, the adjusting sleeve should have plenty of room to handle the difference. This setup is for stock suspension height at this time. I am guessing that if I want to lower the car I will just lower the bottom of the spring. I am posting these pics to show what the inside of a KYB strut looks like. and how thick the tubing wall is. Not a bad idea. I used a dremel cutoff to carefully cut the perch the first time. Not carefully enough because I cut into the tube about .030". I did not like the look of that. So I figured to chock that one up for expensive training and went to the family shop and used the bench grinder. I ground down most of the weld and perch at the weld and without cutting the perch just tapped with a hammer until the perch cracked all the way around at the thin spot. Then, just used the grinder to carefully remove the excess weld material. I was curious how much tubing wall was left on the bad one so I cut it all the way across. The gas pressure in these struts did not seem to be very much. The tubing wall was a little thicker than I imagined but why risk it? Live and learn I guess. I just wanted to share so hopefully no one else gets to learn this one this way. I was looking at the pieces that came off the stock strut and I remembered someone mentioning that the rubber bushing in the top plate may not be designed to handle the up and down stresses from the strut rod. You're misunderstood what I said. I said that the center bushing is designed to handle ONLY the forces from the strut rod, and NOT the weight of the car. The washers are there so that if the bushing fails the car doesn't lose all damping on that corner. If you look at a stock strut, the spring presses against the top plate, NOT against the center bushing. Any coil over setup needs to copy that design. I figured that must be why there is a washer on both sides of the top plate. If I put the washers in the same place with my coilover spring installed it looks like it would work ok but will the top of the spring slide to one side or the other? There are ABSOLTUELY NO PROBLEMS doing things this way. The possibility that the spring may move up to 3/16" in any given direction is a COMPLETE NON-ISSUE. IRRELEVANT. The only time the suspension is ever unloaded enough for the spring to come off the plate is when the car's jacked up, but unless you've got the car ridiculously low, there wo NOT be a problem with the spring coming off the center bushing. This setup will put the entire weight of the car on the center bushing. I do not think that this is wise. hmmm, is there a .gif for humble, or maybe just stupid? Thanks Will, I get it now. So all I really want is to shave down the large washer enough to support the bumpstop and not touch the spring? I'd throw you another plus if I could...! You shouldn't need to shave anything. I used the stock bump stops. The only thing I did to them wat remove the strut boots. The bump stops barely fit inside the springs, but they fit without trimming. The stock washers work fine... no need to modify those at all. i am going with the spring against the top plate as you have yours. I was hoping to use the 3" lower washer in the stock location just below the top plate and just above the bump stop. I was thinking (here i go again...) that the curve on the top surface of the washer was designed to fit the bottom of the top plate in such a way as to allow the rubber to move a little. if the movement is too great then the metal of the washer would contact the top plate and that would be the limit. since the washer looked like it was supposed to support the bump stop on the lower surface i had hoped to retain that function. i was thinking of turning it down to approx 2.125" to 2.25" in order for it to fit inside the coilover. anyway that is what i meant when i said shave the lower washer. are you just using the metal cup in the bump stop for the lower washer? I don't recall having any difficulty fitting the washer back into my spring. I do recall that it was quite snug, but it would go in. I had the washer sand blasted and powder coated, which may have had a slight effect. Yes, the washers are there to limit motion of the bushing. Using that bushing and the washers may have simply been the easiest and least expensive way for GM to incorporate a pivot at that point. It would be interesting to replace it with a large rod-end and see if there ended up being a difference in subjective handling. I am wondering if the larger washers are only on an 88? here is a pic of the washer I have. If the 84-87 have the smaller one that fierohoho posted earlier in this thread then I will swap these into my 86 when I change the struts on it. that way no extra work is done. these large washers are approx 3 3/4" in diameter. The one you have pictured must be an '88 piece. I'd suggest using the early one instead of the one in your picture. I measured my brand new KYBs before I ordered sleeves from Coleman racing; it was 2.00 +/- .02 inches. I can't remember if it was just under or just over 2. I'm leaning towards just under, though. Thats because I just measured my stock struts and they are like 1.99. I ordered the 2.04 ID sleeves from Coleman. They aren't a tight fit, but after installing and lightly pounding in with a screwdriver the included snap ring at the top (it fits into the end of the sleeve with the larger inner diameter shelf machined into it) they center perfectly and are very snug. Does that help? If not I'll try to find my notes if they are still around. That's what I was looking for. They are the same as the Monroes I have. I'm probably going to start out with the monores(that I have) when I get to doing the air bags setup and just needed to make sure I could step up to the kybs if needed without remkaing the lower bag mount!